The present volume is a continuation to Rothstein’s first collection, Two Words to the Wise. 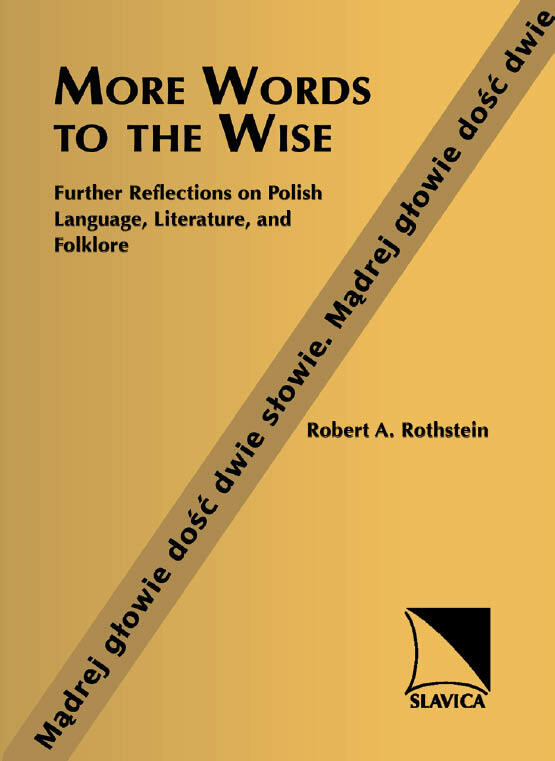 This edited collection of seventy-five of his columns deals with topics ranging from pierogi to pączki, from butterflies to ladybugs (and why the ladybug rejected a marriage proposal from a beetle), from the origins of the polka to the role of pineapples in Polish literature, from why death is portrayed as a woman in Polish folklore and poetry to why Polish folk wisdom claims that there are more doctors than anything else in the world. You don’t have to be Polish – or even know Polish – to enjoy the essays collected here. Since July 2004 the author has been writing about Polish language, literature, and folklore for the Boston-based biweekly Biały Orzeł/White Eagle. Inspired by the calendar, by items in the Polish press, by his experience learning and teaching the Polish language, by new acquisitions for his home library, by questions from readers, and by serendipity, he has explored, among other things, the origins of words and expressions, the grammatical peculiarities of the language, and the reflections of everyday (and not so everyday) life in Polish proverbs and folksongs and in the works of great Polish writers.